Features: Optional non-video homepage, mobile "click" menu, integrated Google fonts. Unlimited videos can be added. Can be combined with other Minisite templates. Details: HTML5, CSS3, JPG images, text or graphic header, Youtube video. Mobile and tablet compliant, iPad, iPhone, etc. Basic HTML web template. Can be combined with any other Minisite. Includes homepage integrated Youtube video and 4 sub video pages. Can be duplicated to add more video pages and unlimited videos. Can be combined with other Minisite RD templates. No graphics editing is required, you can use any wysiwyg or plain text editing software, Notepad or TextEdit on Mac. Responsive for mobile, Minisite web templates are self contained stand alone ad free HTML5 and CSS3 designs that include css Media Queries for the responsiveness. Works with any hosting company and compliant for all browsers and devices, smartphones, tablet, desktop and laptop. See more Minisites. Why Choose an Allwebco Website? Built to W3C web standards and compliant for all computers and devices, Allwebco web templates are complete websites that include webpages already formatted for the most used tasks. Home, about, services, site map, as well as dynamic pages like videos, slideshows, gallery and more. All features and jQuery are built right into the design to save development time. Menus are plain text and colors and fonts are edited in the global css style file. Your website information and images are simply plugged into the pages. Returnable within 30 days for a full refund we include a free extended download service so you can request a free download at any time, including when we update the design. Free template addons are available and we offer the best support center in the industry. 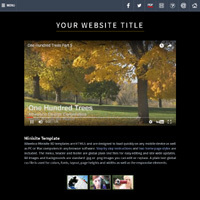 Minisite web templates are sold exclusively on the Allwebco website and are not available anywhere else.